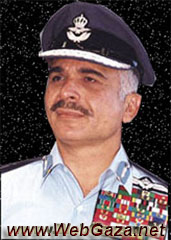 King Hussein I - Who is King Hussein of Jordan? Who is King Hussein of Jordan? Born 14 Nov, 1935. Death 7 Feb, 1999. Became king of Jordan in 1953 after his father, Talal, was declared mentally unfit to rule. His grandfather, King Abdullah I, had been assassinated in 1951. Educated at Harrow and the Royal Military Academy at Sandhurst, England, Hussein pursued a moderate, pro-Western policy while maintaining solidarity with the other Arab countries. As a result of the Arab-Israeli War of 1967, he lost all the Jordanian territory west of the Jordan River to Israeli occupation. In 1988, King Hussein relinquished claim to the Israeli-occupied West Bank, which had been annexed by his grandfather in 1950, in favor of the PLO. Jordan and Israel ended their 46-year state of war on 25 July 1994. In 1995 he visited Jerusalem for the first time since the 1967 war to attend the funeral of assassinated Israeli leader Yitzhak Rabin. In 1998, King Hussein again received cancer treatments in the United States, he had undergone cancer surgery in 1992. In January 1999, Hussein returned to Jordan accompanied by massive public demonstrations of support by Jordanians. During this brief visit, after which he returned to the United States for further medical treatment, he replaced his brother Crown Prince Hassan, who had been his designated heir since 1965, with the eldest of his five sons, Prince Abdullah bin Hussein, who was named crown prince and regent. His treatment having failed, Hussein returned to Jordan in February to die. His eldest son succeeded him as King Abdullah II. Prior to his death, King Hussein had been the Middle East's longest-reigning ruler. He survived at least 12 assassination attempts and left behind him a stable country at peace with its neighbors, including Israel.